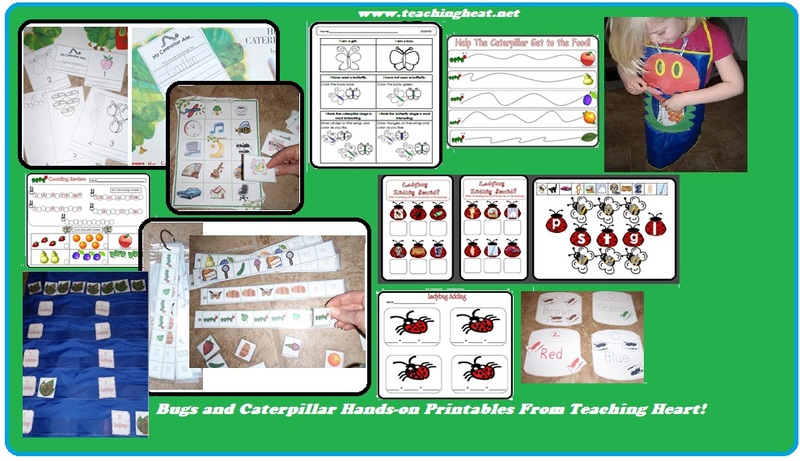 Over 30 Pages of Hands-On Resources (17 files) For you to Print and Use with a Bug and/or Caterpillar Theme. 2.) Roll a Caterpillar GamePrint out one game board for each player. Print out one set of caterpillar pieces per player. Students take turns rolling the dice and then selecting the caterpillar piece they rolled. First person to roll all the caterpillar pieces wins. After the game, havestudents glue down the pieces to make a caterpillar to take home. 3.) Caterpillar ApronAll pieces and directions needed to make the apron seen.Use to retell the story by feeding the caterpillar the items in the correct order. 4.) Caterpillar Paper Bag PuppetAll pieces and directions needed to make the puppet seen. 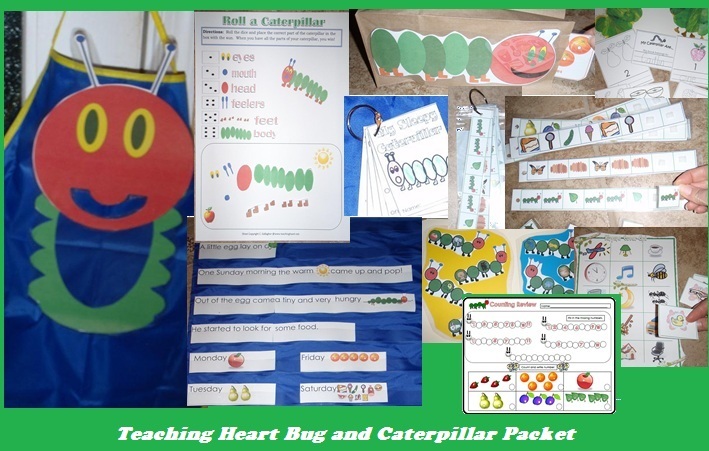 Use to retell the story by feeding the caterpillar the items in the correct order. Have each student make one by cutting out the pattern and gluing it to a paper bag. They can take their puppet and story pieces home to retell the story to a family member. 5.) Sleepy Caterpillar StoryA mini book for your students to make. They color the pages based on the color word used on the page. Also, they add a number in the blank after counting the leaves on the page. Once finished the pages are cut and either hole punched or stapled to form a little book to take home and share. 6.) Beginning Sound Match UpAll pieces needed to make a beginning sounds center. Each caterpillar has two pictures on its body. Students place the beginning sound next to the picture. 7.) Read and Number Layered BookA book for your students to make. Students color the pictures and write the number words on the line. 8.) Pattern CardsReady to print pattern cards. Laminate and use Velcro to attach the missing pieces. Store on a ring. 9.) Rhyme GamePrint out caterpillar game board and the butterfly cards. Cut out the butterfly cards. Stack butterfly cards face down. Students take a butterfly card and look at the picture and cover up a picture on the caterpillar card that rhymes with the picture on their butterfly card. 10.) Counting Review Student fills in missing numbers and counts the objects and writes the number. 11.) Butterfly GlyphMaterials and directions to make Butterfly Glyphs. Includes patterns and legend. 12.) Ladybug Ending SoundLetter mat with matching pictures. Student places picture on top of correct ending sound. 2 write the ending sound printables. 13.) Bug Graph Students cut and glue bugs onto a graph. Students answer questions about their finished graph. 14.) Caterpillar TraceTrace the dotted line to take the caterpillar to a healthy snack. 15) Lady Bug Adding Student count dots to make a math addition problem . 16.) How Many Ladybugs Pocket Chart Students count the ladybugs on each leaf and match it to the correct number. 17.) Sort by Color, Count, TraceStudents cut out bugs, sort them by color, write how many in the circle, and trace the color word. To reuse with small groups, laminate and use a dry erase marker. 14.99 - Less than a dollar a file! Instant Download as soon as you place your order. If you would rather use Teachers Notebook, I have it in my Teacher's Notebook Store as well!!! Click here to view it there. Click here to view more resources on our Caterpillar Page!